Our next stop on the cruise was Grenada. It was another relaxing island, similar to Dominica; however, as our boat arrived late and was scheduled to leave early, and the weather was also wet and rainy, we didn’t see very much of the island at all except for the main town. 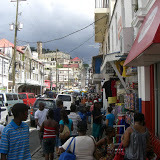 Grenada is known for its spices and we picked up a few packages at a great price. Two random, unrelated things that I’ve noticed are that these Caribbean islands seem to like Maggi a lot, and Canadian banks seem to have a big presence here as well.